Click the photo below to enter to win the $100 GC giveaway! My father had four sisters…. three had breast cancer & one died from breast cancer. My mom was one of five girls. All found lumps in there breasts. One had a cancerous lump & after a long battle succumbed to the cancer that spread throughout her body. The others were benign (thank god). 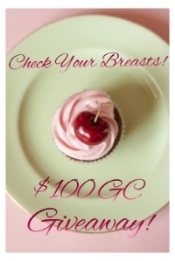 Early detection is they key….please please do self exams & see your Dr every year! What a story. I hope you are keeping an eye on yourself as well. Getting to know our bodies, what is ‘normal’ for them and not is so important. Thank you for sharing. Sorry about losing your aunt. Big hugs! So sorry hun. My grandmother, too. And my mom. It is hard to say goodbye. Great reminder. The mammograms are fine, but not the only thing needed. I had such fibrous tissue nothing would show up even though my tumor was right under the skin. Scary. So glad you are well.